As you know from an earlier post I grew up being inspired by my father to love nature and appreciate the world around me. I always try to point out animals, birds and insects etc to my son whenever we are off on our travels and on our pre-school walks we always have our eyes and ears peeled. So we’re going on a Snail Hunt to see what we can see. 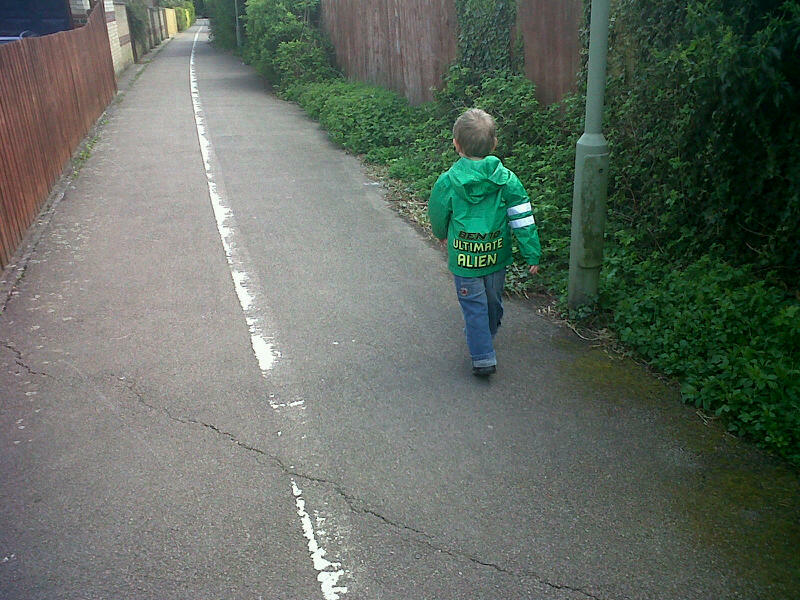 Our pre-school walk is mainly along a long passageway through our estate, but it’s a brilliant place to spot birds, bees, butterflies and the like. With the stormy weather we’ve been having this week it was an ideal time to show Monkey lots of snails and slugs. We’ve been talking about them a lot as we need to plant our seedlings out soon as he knows that we need to keep snails and slugs at bay. So off we went on our walk, no ordinary walk ……. 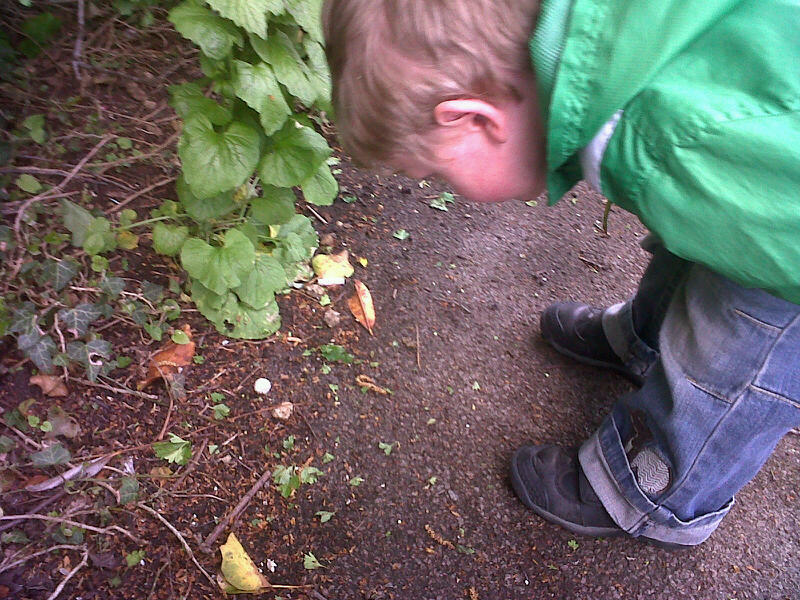 we were on a Snail Hunt …..
You can just about make out the white shell of this particular snail, but we found loads of snails on our walk – all sorts of coloured shells. Monkey was fascinated and it’s added a real sense of adventure to our walk over the last few days. When we got home he scouted around our back garden for more snails, carefully put all the ones he could find in an empty plant pot and then sat mesmerised watching them slowly slide their way up and out to freedom. Hours of entertainment – FREE, and educational at the same time. One happy Monkey, one happy Mummy. I think it’s great that you are a bug loving Mummy who doesn’t mind going on a snail hunt! It’s not surprising that you have one happy little boy enjoying watching his finds. Thanks for linking up your bug adventures to Country Kids. Fine with bugs, put me next to a snake and it would be a different story! Going on a snail hunt eh 🙂 it looked like fun! What a great idea! Think my Noah would love that, Isla on the other hand has developed an irrational fear of ‘creatures’! Oh my little boy loves a good snail trail!